On behalf of the Albion Football Club we would like to congratulate Chris O'Keefe on being appointed Assistant Coach of the 2017 WRFL Senior Interleague team set to take on the Northen Football League this year. Chris was excited to be apart of the team which featured 3 Albion players last season. "I was approached by the WRFL Interleague coach Anthony Eames to see if i was interested in being involved in the interleague campaign this year and i immediately agreed to be part of it" said O'Keefe. O'Keefe who will pull on the Blue and White hoops this year said " The opportunity to work with the best players in the league was something that I was happy to be involved in". It will be great to see what the best of both leagues have to offer and will no doubtedly be a great match as always! 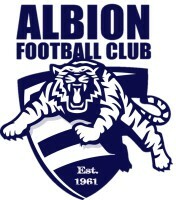 Lastly O'Keefe said "I am a big supporter of representative footy and encouarge all players to be part of it, hopefully we will see a number of Albion players involved this year"
All the best to O'Keefe and the WRFL! We will let you know more information about who has been selected in the squad as it comes to hand!